50 Drinks in 50 States: A Blue Hawaii in (Wait For It…) Hawaii! Welcome back to our utterly boozy, never snoozy, weekly lesson on America’s cocktail history. If last week’s Washington Apple proved a little too whiskey-heavy, then chin up. Because week we’re going true blue in Hawaii. 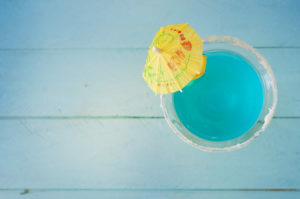 The Blue Hawaii, with its base of Blue Curacao liqueur, practically screams “vacation in paradise” — yet this particular bevvie breaks the mold by striking a perfect balance between strong and sour. So how did this cool, refreshing and not-too-sweet drink come to be? In 1957, a Dutch distiller from Bols Distillery traveled to Hawaii for a liquor convention. After visiting many a hotel, he landing on the Hilton Hawaiian Village in Waikiki, home to legendary head bartender Harry Yee. This distiller charged Harry with creating a brand-new cocktail, featuring Bols’ Blue Curacao liqueur. Mr. Yee mixed rum with vodka, added some classically Hawaiian touches, and the Blue Hawaii was born. Combine all ingredients, stir, and pour over ice. Add your garnish and umbrella, lay back and take a sip. Looking for a frozen version? Add some creme de coconut, ice and blend it all together!